Interested in Woodland Plants for your landscape? 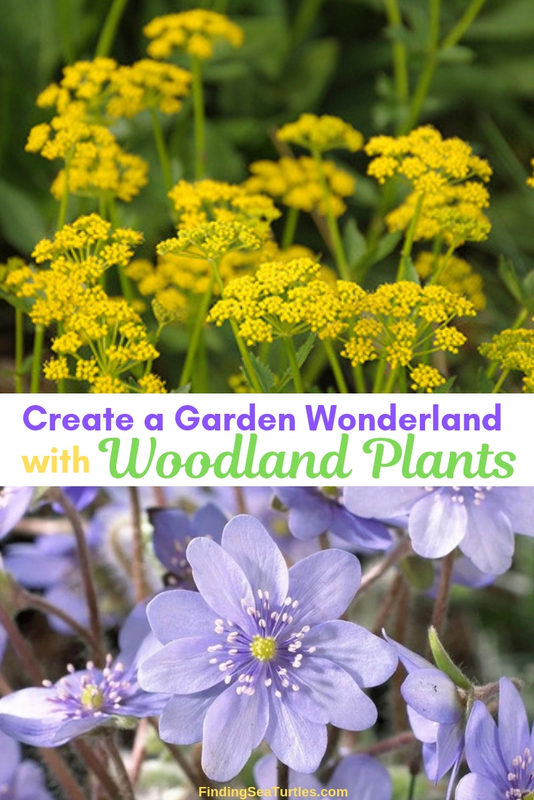 Create a Garden Wonderland with Woodland Plants. Add to an existing Woodland Garden. Or create a new Woodland Garden . 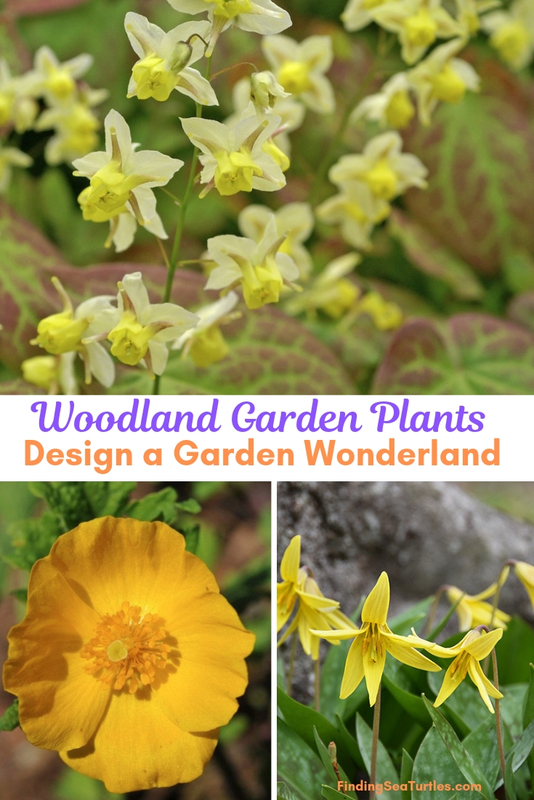 . .
Use woodland plants in a landscape to create a garden wonderland. 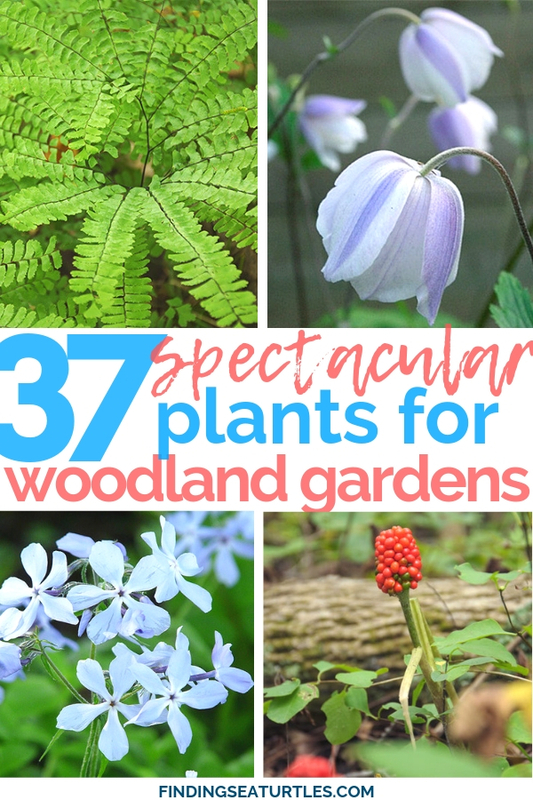 If you have wooded areas in the yard, add a few woodland plants. Woodland areas provide invaluable shade during the Summer season. 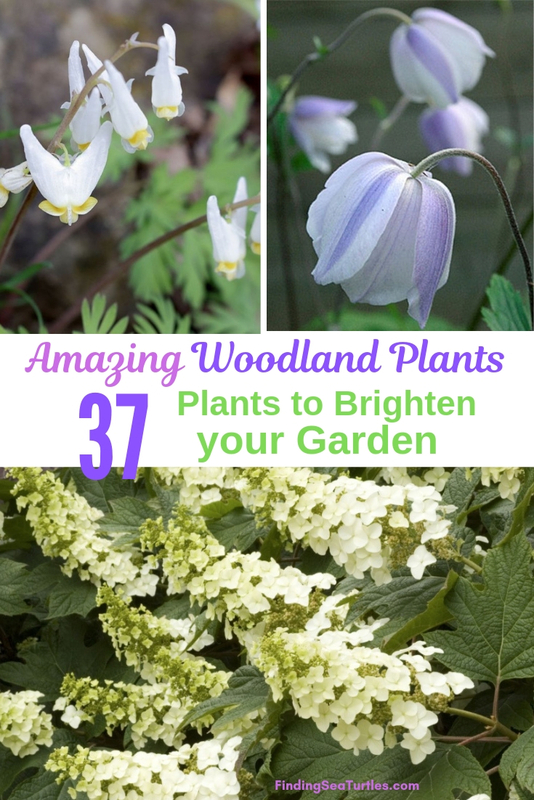 However, if your woodland yard area seems dark or mundane, add a few of these woodland plants. The right woodland plants can make a difference in the whole look of your landscape. There are many woodland plants to select from. And in a variety bloom colors as well as foliage. Some are native plants. Some provide nectar to the local wildlife. 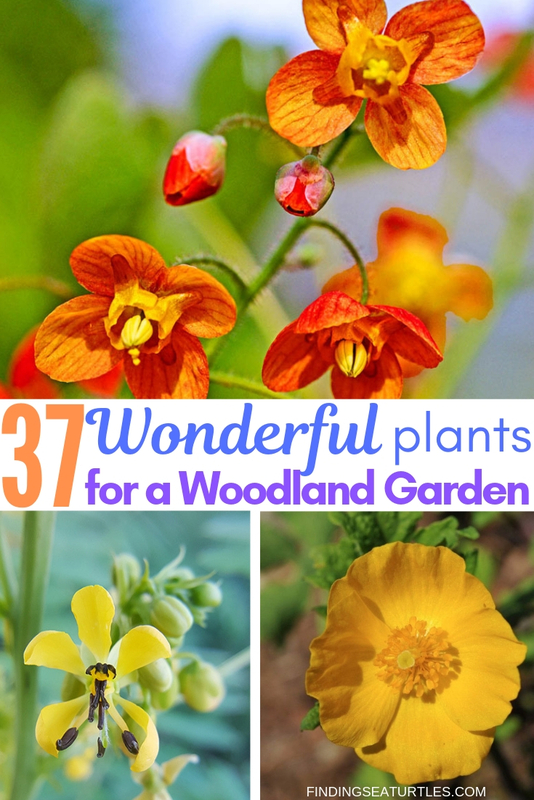 Whether you have an existing Woodland garden or you’d like to start one, go ahead. You may even be surprised at how woodland plants can change the entire look of a yard or woodland garden area. Some believe that deep shade from trees will limit what can be planted underneath them. But actually, there many shade loving plants to select from. However, when selecting plants consider the cold hardiness zone, soil moisture level, and soil conditions. Many woodland plants are acid-loving. Adding Sphagnum peat moss to the soil accomplishes two things. It provides an acidic base and helps with water retention. Water retention keeps the soil moisture level moist and prevents the soil from drying out. Some woodland plants are Ephemerals. Ephemerals have short life cycles. These perennial plants emerge from the ground in early Spring. They bloom and reproduce. Then they die back to the ground. Not to be seen again until the following Spring. It is a brief but beautiful appearance. Some Ephemerals are Spring blooming. They appear in the early Spring season. This short life cycle of Spring blooming ephemerals is due to the environment they live in. Woodland forests typically have shrubs and trees that lose their leaves the previous Fall. In the Spring, as Winter begins to fade, high levels of sunlight penetrate the woodland soil. This warms the Spring blooming ephemerals. With the warming of the forest soil, these smaller herbaceous perennials slowly emerge. This occurs before the woodland canopy covers the woodland soil. A beautiful short lived life that adds to the anticipation of Spring. We’ve gathered a few woodland plants that can make a difference to your woodland landscape. Take a look. And let us know what you think. There are quite a few to choose from. 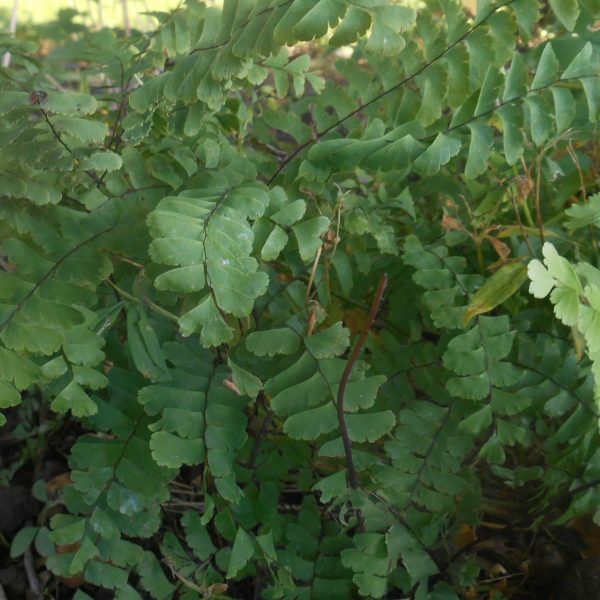 Maidenhair Fern is also known as Adiantum pedatum. Maidenhair Fern has delicate leaflets arranged in rows. Grows in zones 3 to 8 in full shade. Reaches between 1 to 2 feet tall with a 12 inch spread. Likes sand, loam, or clay soil conditions. Likes moist soil. A North American native including Wisconsin. Deer Resistant. Beautiful green foliage with a rhizome root system. Plant to naturalize shaded hillsides or shady garden areas. A top 100 “Must Have” Piet Oudolf plant. 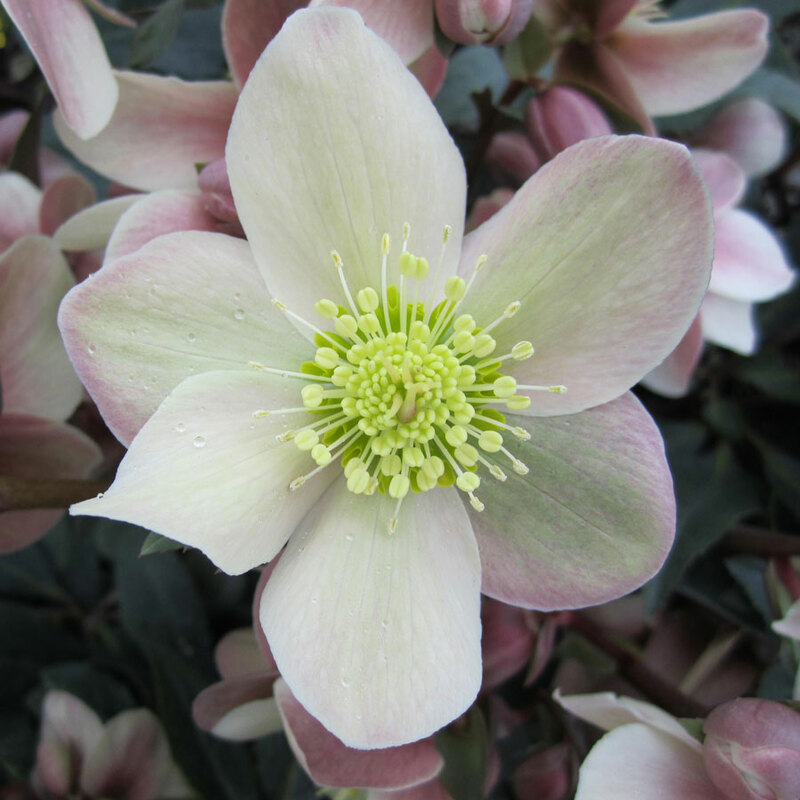 Helleborus is also known as a Lenten Rose or Christmas Rose. 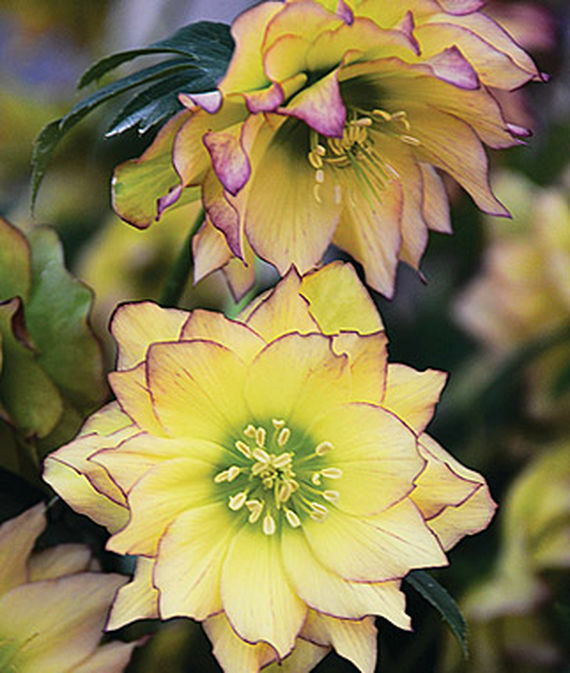 Love Bug is part of the Helleborus Gold Collection. Love Bug blooms have cream with light rose tones colors. Upward facing blooms have lime yellow pistils. Foliage is blue-green to dark green with wine colored stems. Grows in zones 5 to 9 in full shade. Tops out between 10 to 12 inches high. A deer resistant perennial that likes moist, well-draining normal loamy soil. Growth habit is a mounding form. Plant in garden beds, borders, and in containers. Use as cut flower bouquets. Provides foliage interest and Winter interest in the garden. First Dance is part of the Wedding Party Helleborus series. First Dance has bright yellow double flowers with maroon picotee, edging, and veining. Showy blooms are 3 to 3 ½ inches wide. Blooms in the Spring. Grows in zones 4 to 9 in full shade to part Sun and part shade. Reaches 18 to 24 inches tall. Resistant to deer and rabbit. Plant in garden beds or borders. Use First Dance as cut flowers in a floral bouquet. Hellebores are happy to naturalize in shady woodland setting. Victoria Lady Fern is also known as Athyrium filix femina ‘Victoriae’. Grows in zones 4 to 8 in full shade to part Sun and part shade. Reaches between 18 to 24 inches tall and wide. Fronds are finely divided with tiny twisted leaves that cross over. A vigorous grower, Victoria Lady Fern is known as “the Queen of Green.” Likes moist, well-draining soil. Popular Victorian fern that was discovered in 1861 in Scotland. Easy to grow Jack in the Pulpit is also called Arisaema triphyllum. Blooms have a green and brown striped hood that hides a spadix (a jack). The spadix or jack is covered in numerous tiny green to purple flowers. Blooms appear in April and May. Grows in zones 3 to 9 in full shade to part Sun and part shade. 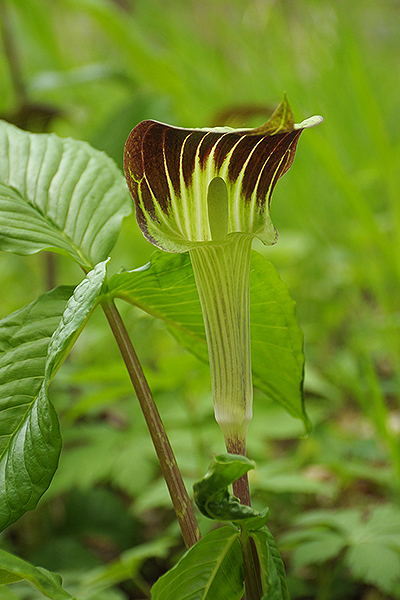 Loved by birds, Jack in the Pulpit reaches between 1 to 2 feet tall. After blooming, the flower develops bright red berries in late Summer. Birds and other wildlife eat the berries. Likes sand, loam, or clay soil conditions. Moisture levels of medium, moist, or wet conditions are best. The root system is a corm. Seen in the spring woodlands of eastern North America, Jack in the Pulpit arrives in May, in Wisconsin. 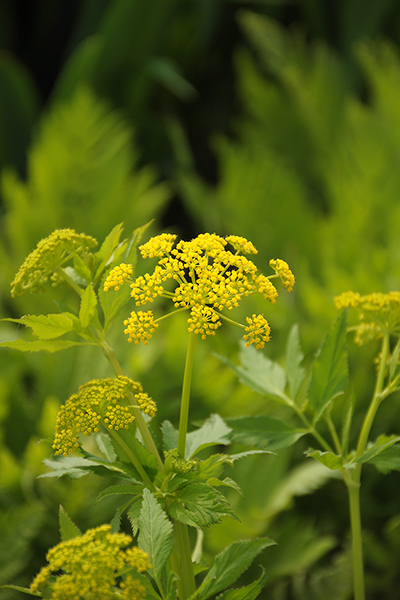 Golden Alexanders is known as Zizia aurea. Golden Alexanders has brilliant golden yellow umbels. Blooms appear in May through July. Grow in zones 3 to 8 in full shade to part Sun and part shade. Reaches 1 to 2 feet high. Likes soil conditions that are sandy, loam, or clay. Moisture levels of consistently moist to wet, well-drained soils are preferred. Ideal low-growing selection for heavy clay soils in semi-shade to full Sun. Root system is fibrous. Golden Alexanders is beneficial for pollinators. Deer resistant perennial. Servers as a host plant for the Black Swallowtail butterfly. The Black Swallowtail butterfly lays its eggs on umbelliferous plants. Host plant for the Missouri Woodland Swallowtail butterfly. Plant in a shady, naturalized or woodland garden. Celandine Poppy is also known as a Wood Poppy and Stylophorum diphyllum. 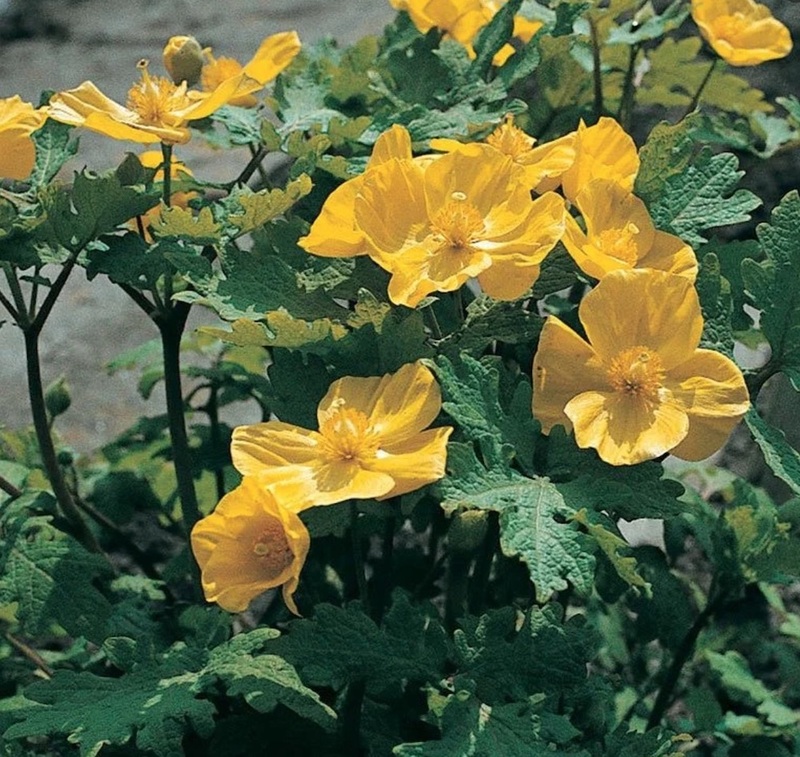 Celandine Poppy has sunny yellow blooms with frilly centers. Foliage is blue-green. Blooms early to late Summer. Grows in zones 4 to 9 in full shade to part Sun and part shade. Reaches 14 to 18 inches tall. A native ground cover. Likes sandy, loamy, or moist, wet soil conditions. Tolerates wet sites. Plant in areas that are wet, woodlands and use in rain gardens. Native low-growing perennial makes an excellent ground cover. Some parts are toxic to animals if ingested. Trilliums are spring-blooming wildflowers. Trillium blooms are delicate, 3 petaled flowers with distinctive foliage. Requires rich, slightly acid, woodsy soil that never dries out completely. Dormant by late summer. A woodland garden must-have. Plant trilliums in groups. A Spring ephemeral that blends easily with other low growing woodland wildflowers. Virginia Bluebells and Shooting Star wildflowers are a perfect mix with Trilliums. White Wake Robin is also known as Trillium grandiflorum Flore Pleno. White Wake Robin has double pure white blooms. Blooms appear from April to May. Grows in zones 4 to 7 in full shade to part Sun and part shade. Tops out between 12 to 18 inches. Likes moist rich, slightly acidic woodsy soil. 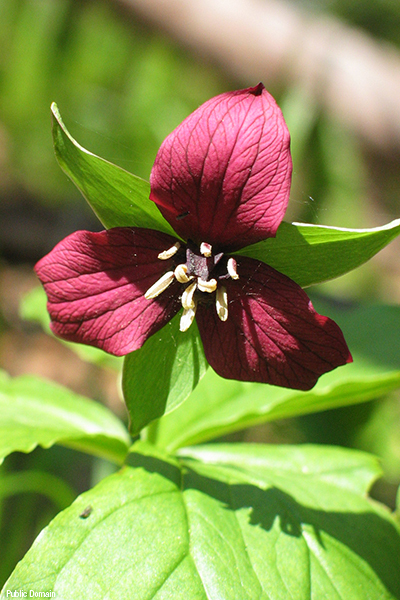 Red Trillium is also known as Purple Trillium, Stinking Benjamin, Wakerobin, and Trillium erectum. Blooms are a crimson red color. Blooms appear in April, May, and June. Grows in zones 3 to 7 in full shade to part Sun and part shade. Tops out at 12 inches. Likes sandy, loam, or clay soil conditions with a moisture level of moist to medium. Root system is a corm. The crimson blooms lasts up to 3 weeks before fleshy berry-like fruit appears. Birds and mammals eat the berries. A hardy Trillium and native to deciduous forests of the Northeast. Needs ample sunlight early in the growing season. Requires rich soil with consistent moisture. Add leaf mulch to maintain moisture and acidity levels. 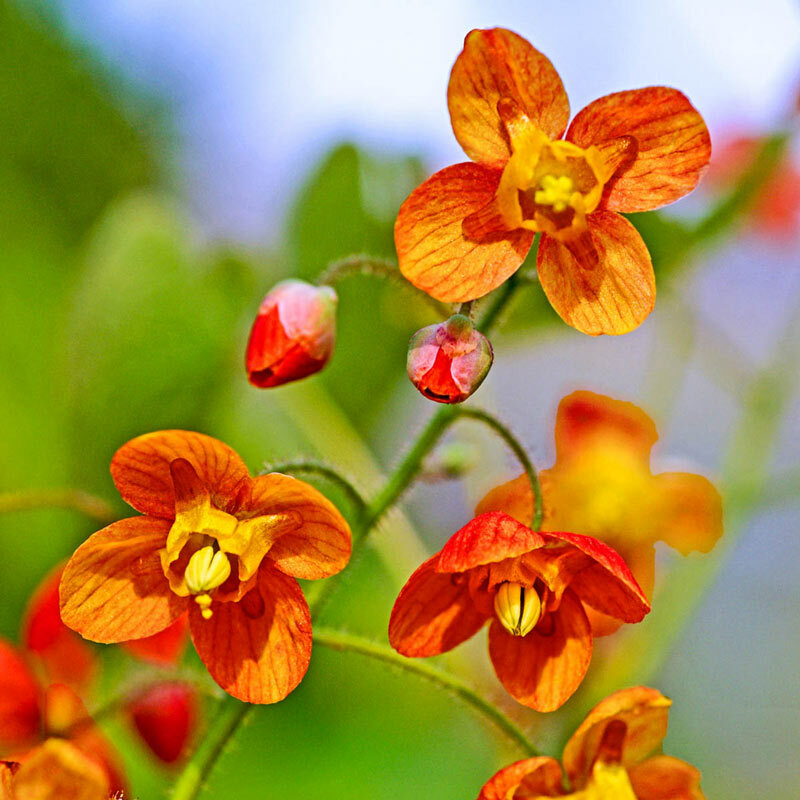 Bishop’s Hat is also known as Red Epimedium, Red Barrenwort, and Rubrum Epimedium. Bishop’s Hat has pink flowers. Blooms in April. 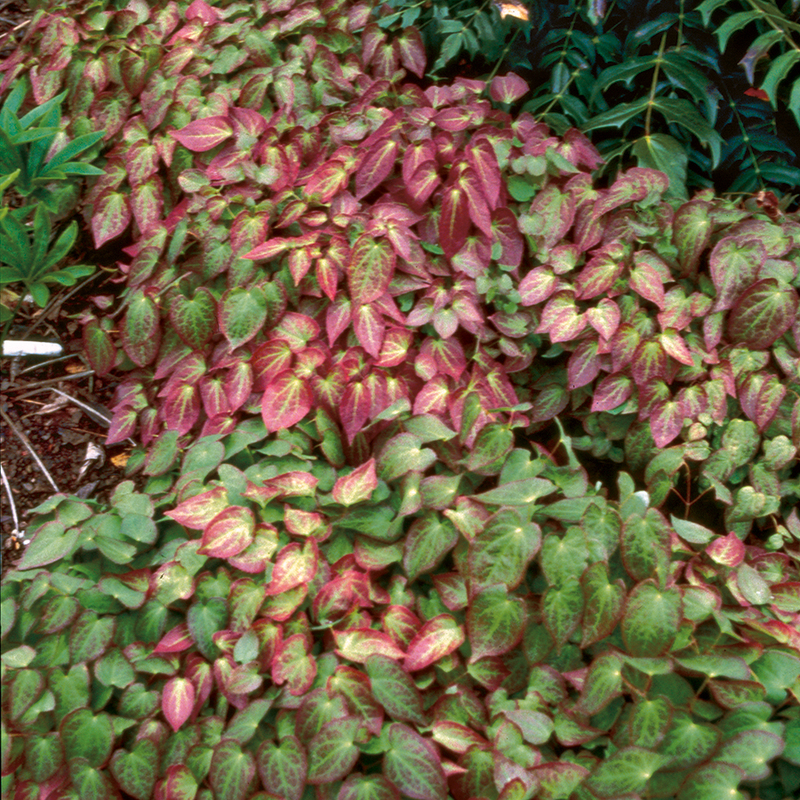 Foliage is thin, heart-shaped leaves with red tinge that turns bronze in the Fall. Grow in zones 5 to 9 in full shade to part Sun and part shade. A petite perennial reaches between 6 and 12 inches tall. Resistant to deer, rabbit, and disease. Tolerant of drought once established. Plant as a ground cover for dry shady garden areas. Planted along a path makes a striking look. Mass planting in a woodland garden or beneath trees provides exceptional coloring. Bishop’s Hat spreads beautifully in a shady area. Wild Blue Phlox is also known as Wild Sweet William and Phlox divaricata. Fragrant phlox has blooms of pale lavender to blue shades. Flowers are tubular with five petal-like lobes. Attracts butterflies, clearwing moths, and hummingbirds. Native woodland phlox develops round green fruits that become seed capsules with black seeds. Blooms in May and June. Grows in zones 3 to 8 in full shade to part Sun and part shade. Reaches 1 to 2 feet tall. 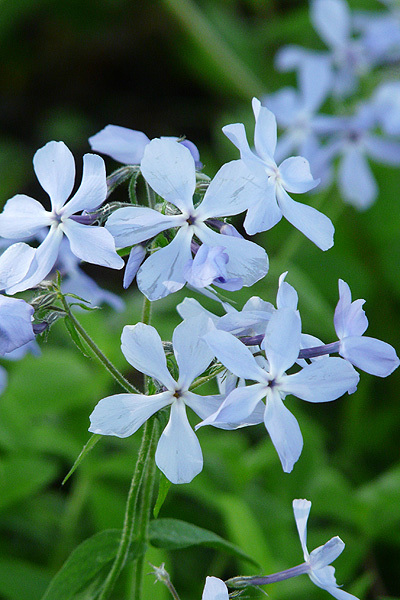 Pollinators, butterflies, birds, and hummingbirds are attracted to Wild Blue Phlox. Likes sandy, loam, or clay soil conditions with moisture levels between medium to moist. A fibrous root system, plant in rich, moist, well-draining soil. Tolerates dry and clay soils. Tolerant of drought conditions once establish. 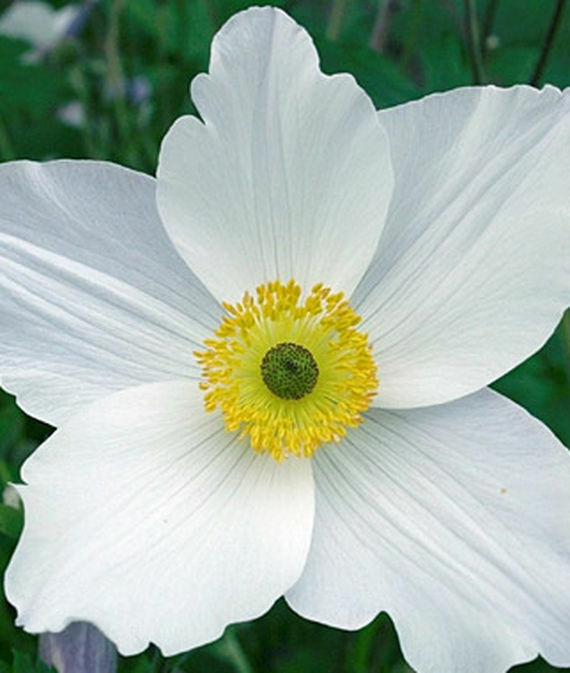 Plant in native woodland gardens, naturalizing areas, shaded rock gardens or low borders. Bloodroot is known as Indian paint, Red Puccoon, and Sanguinaria canadensis. 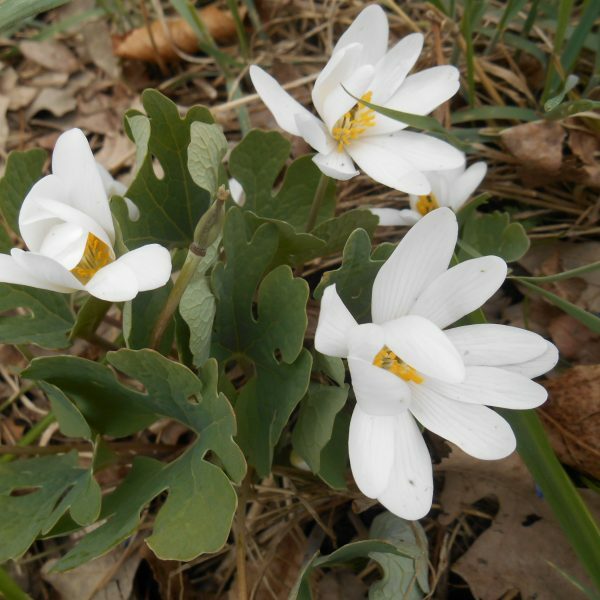 Bloodroot has white anemone-like blooms in Spring. Grows in zones 3 to 9 in full shade to part Sun and part shade. Likes moist well-draining soil. Reaches 6 inches tall and about 12 inches wide. White anemone-like blooms in Spring from the center of glaucus, rolled leaves. An ephemeral, dies back in the summer. 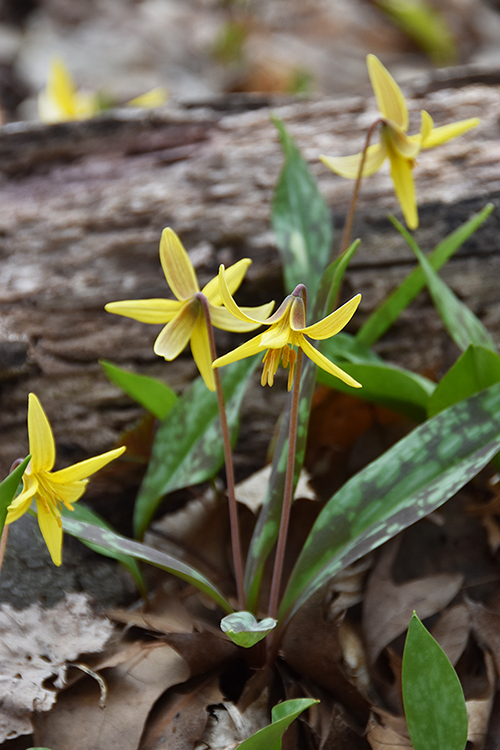 Trout Lily is also known as Dogtooth Violet, a true lily and Erythronium americanum. A Spring ephemeral – Trout Lily has maroon-mottled leaves. Slender stalks have nodding yellow flowers. Yellow blooms appear in April and May. Grows in zones 3 to 8 in full shade to part Sun and part shade. Tops out at 6 inches. Likes loam or clay soil conditions with moisture levels of medium or moist. Root system is a corm. A Spring ephemeral. Trout Lily has maroon-mottled leaves with slender stalks of yellow flowers. 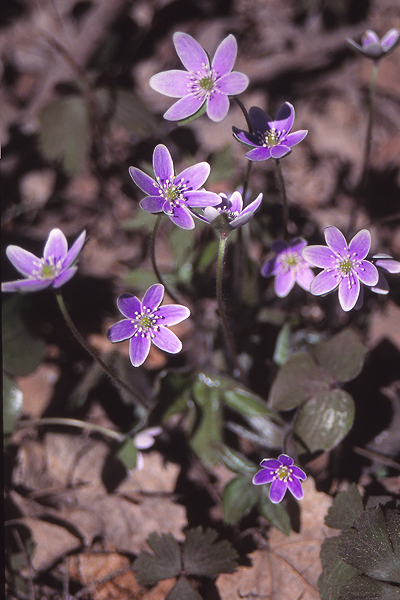 Sharp Lobed Hepatica is also known as Hepatica acutiloba. A Spring ephemeral, Sharp Lobed is a an early blooming woodland wildflower. Flowers are pink to lavender and white appear in March and April. Provides an early nectar source for pollinators. Mottled foliage is three lobed leaves and usually evergreen. Grows in zones 4 to 8 in full shade to part Sun and part shade. Tops out at 3 to 6 inches tall. Likes soil that is sandy or loam with medium to moist soil. Beneficial to pollinators, bee friendly. Native perennial. Likes loamy, moist wet, or acidic soil conditions. Some plant parts are poisonous if ingested. Provides year round interest. Dwarf Crested Iris is also known as Iris Cristata. Dwarf crested iris has lavender, purple and blue blooms. Blooms appear in April and May. Grows in zones 3 to 8 in full shade to part Sun and part shade. Tops out at 6 inches. Likes soil that is either sandy or loam with medium to moist soil conditions. Beneficial to pollinators. Attracts bees and hummingbirds. Deer resistant perennial. Plant as a ground cover. 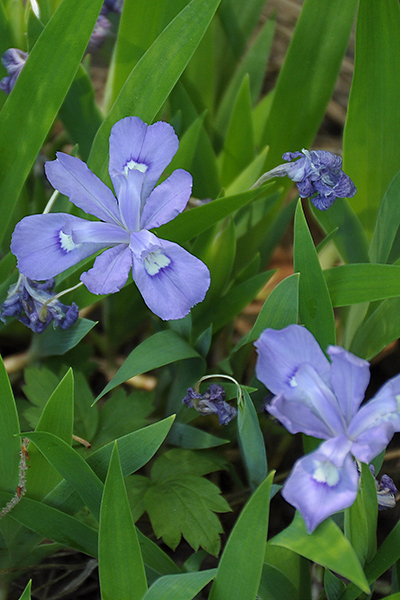 Dwarf Crested Iris produces a gorgeous drift of blue color in the Spring woodland garden. Complement to other low growing shade species. Native to wooded uplands. Dwarf Crested Iris forms a ground cover with partial shade and medium-moist soil. Ideal for a shaded rock garden, or a naturalized woodland slope. 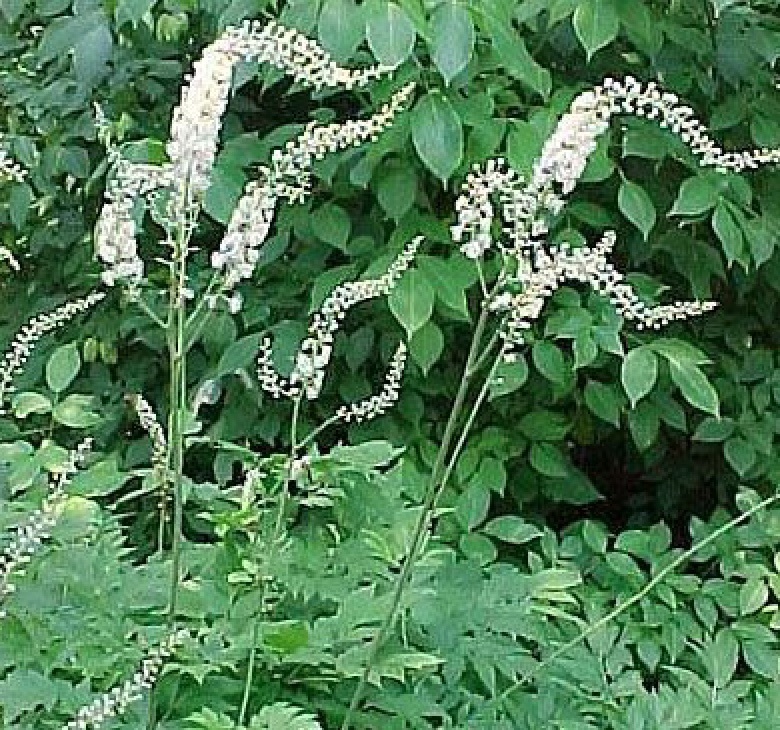 Black Cohosh is also known as American Bugbane, Black Snakeroot, Fairy Candles, or Actaea racemosa. Foliage is green, lacy Astilbe-like. Blooms from early to midsummer. Grows in zones 4 to 8 in full shade to part Sun and part shade. Reaches 4 to 6 feet tall. Likes loamy, or moist, wet soil conditions. Resistant to deer and rabbit. Fragrant native perennial that is poisonous in large doses. Native Black Cohosh likes wet woods and thickets. Recently reclassified, formerly called Cimicifuga racemosa, official botanical name is now Actaea racemosa. Yellow Waxed Bells is also known as Kirengeshoma palmata. 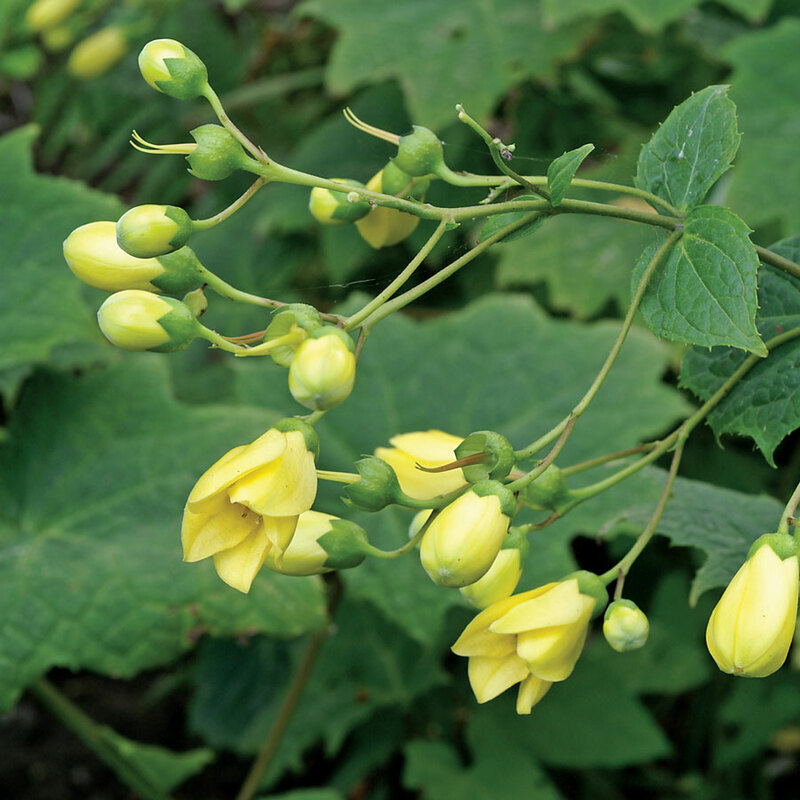 Yellow Waxed Bells have bright yellow blooms with huge, maple-like leaves. The bell-like flowers on purple branches appear from midsummer to Fall. Funnel-shaped blooms reach 1 to 2 inches long. Grows in zones 5 to 8 in full shade to part Sun and part shade. Reaches about 3 feet tall. Plant in garden beds and borders. Widow’s Tears is also known as Tinantia pringlei. 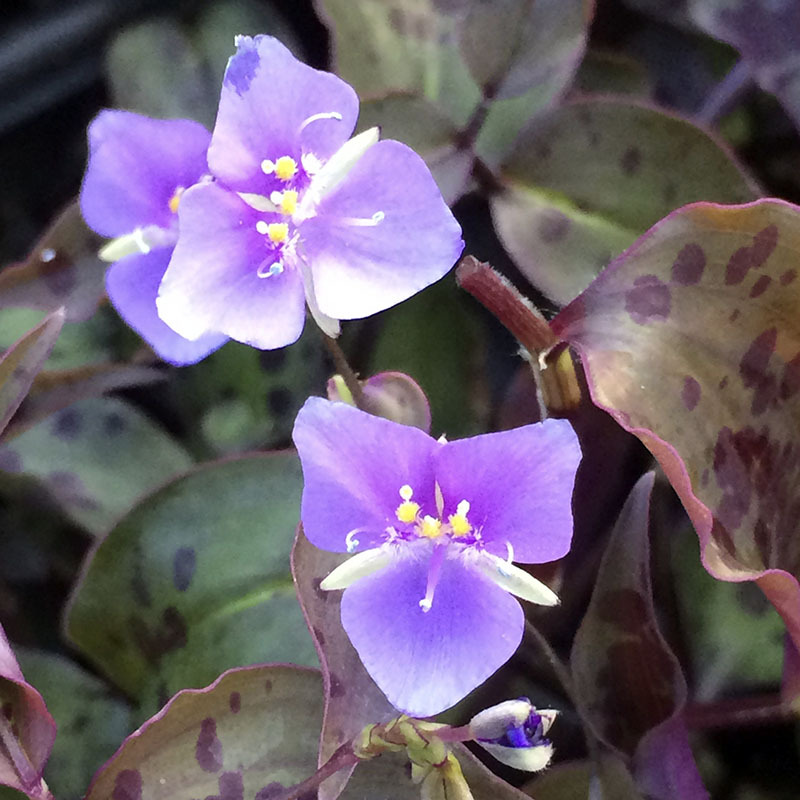 Widow’s Tears has light purple flowers over mounds of dark purple, speckled foliage. Grows in zones 7 to 10 in full shade to part Sun and part shade. Reaches 6 to 12 inches tall with a 3 feet spread. Plant in a woodland garden or in a container. 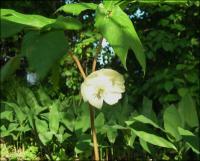 Mayapple is also known as Hog apple, Mandrake or Podophyllum peltatum. Grows in zones 4 to 9 in full shade to part Sun and part shade. Reaches 18 inches tall and 4 feet wide. Likes moist well-drained soil. Tolerant of Black Walnut Juglone soil conditions. Native to Wisconsin and other areas. Spreads by rhizomes. Named for its leaves that resemblance to a duck’s foot. Wild Ginger is also known as Asarum canadense. Wild Ginger has crinkled, lacquered, round leaves. Below the ground cover are brown bells with flared tips. Mauve-purple flowers hidden under its foliage. Grows in zones 3 to 7 in full shade to part Sun and part shade. Tops out at 6 inches with a 6 inch spread. 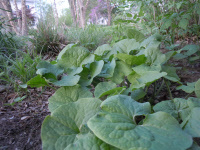 Easy to grow Wild ginger prefers fertile, moist, well-draining soil. Native from Canada to North Carolina. Concealed brown bells with flared tips hide under this ground covers crinkled, lacquered, round leaves. Plant’s rhizomes have a ginger-like aroma. Dutchman’s Breeches is also known as Dicentra cucullaria. Native Dutchman’s Breeches is a small, wild version of Bleeding Heart. Blooms are a creamy white. 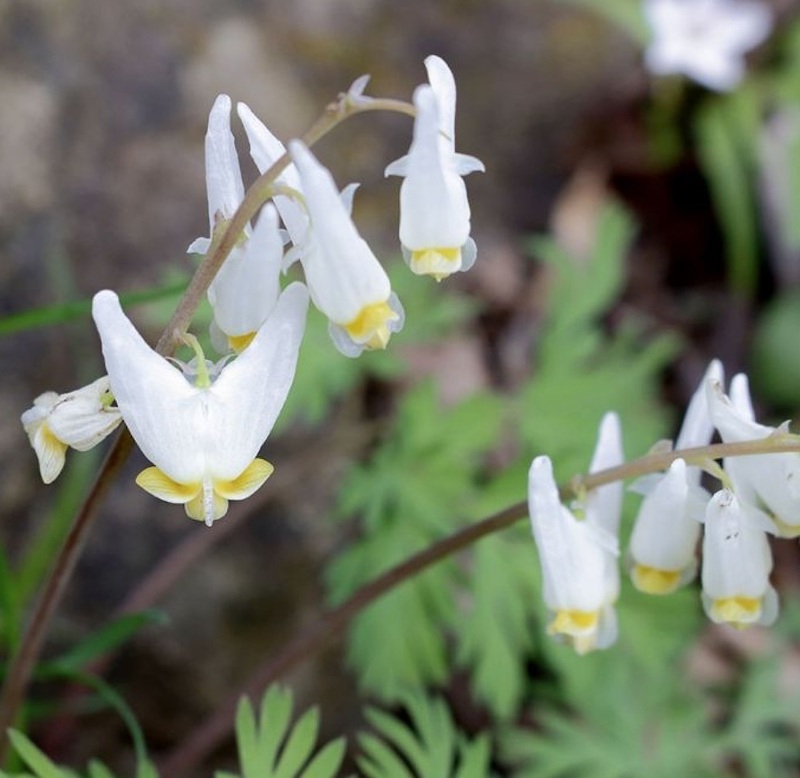 Named Dutchman’s Breeches because they resemble a pair of upside-down, hung-to-dry pants. Blooms in early to mid Spring. Foliage is a fern-like mound of blue-green foliage, changing to pale yellow. Grows in zones 3 to 8 in full shade to part Sun and part shade. Reaches 12 inches wide. Likes well draining soil. Bee friendly, deer and rabbit resistant. Striking addition to a shade or woodland garden. Poisonous if ingested. 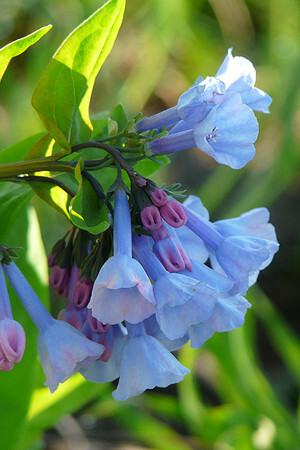 Virginia Bluebells are also known as Virginia Cowslip, Lungwort, Roanoke Bells, or Mertensia virginica. Blooms are pink, lavender, and blue. Blooms in April and May. Grows in zones 4 to 7 in full shade to part Sun and part shade. Reaches 1 to 2 feet tall. Attracts pollinators and hummingbirds. Likes sandy, loam, or clay soil conditions. Native woodland wildflower to the eastern U.S. and a true harbinger of spring. Early season pollinators love the blooms. Long-tongued bees such as bumblebees and mason bees provide cross-pollination. Other visitors include the Giant Bee Fly, butterflies, skippers, and Sphinx moths. Virginia Bluebells are dormant in summer. Plant with other perennials. Prefers a rich, moist soil. 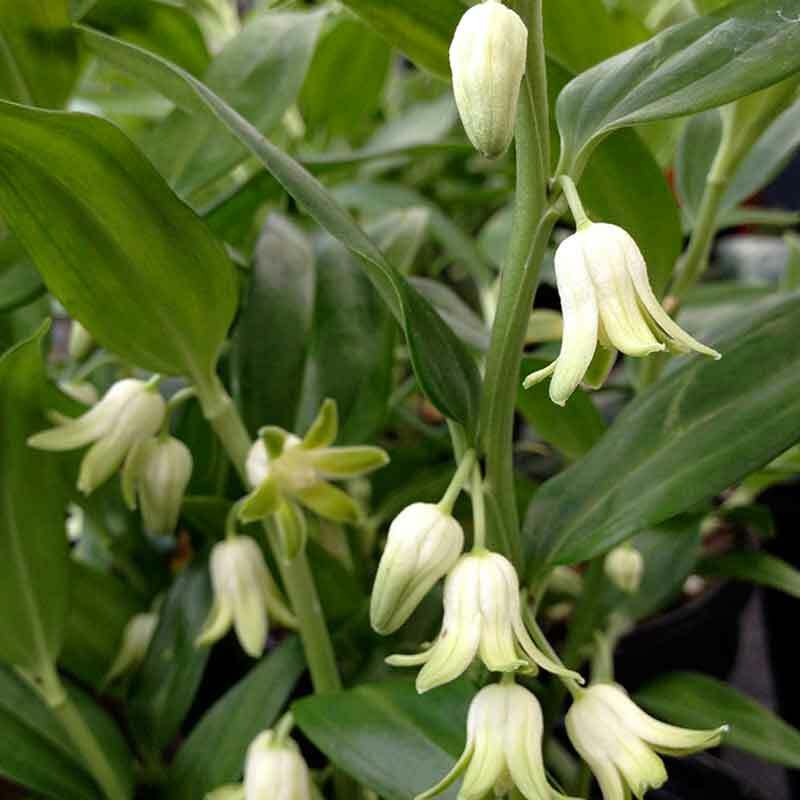 Solomon’s Seal is also known as Disporopsis pernyi. Disporopsis has white bell-shaped flowers. Blooms in the Spring. Foliage is arching, glossy and evergreen. Grows in zones 6 to 9 in full shade to part Sun and part shade. Reaches 12 to 18 inches tall. Plant in average soils. Grow as a ground cover or plant in Japanese-style garden. 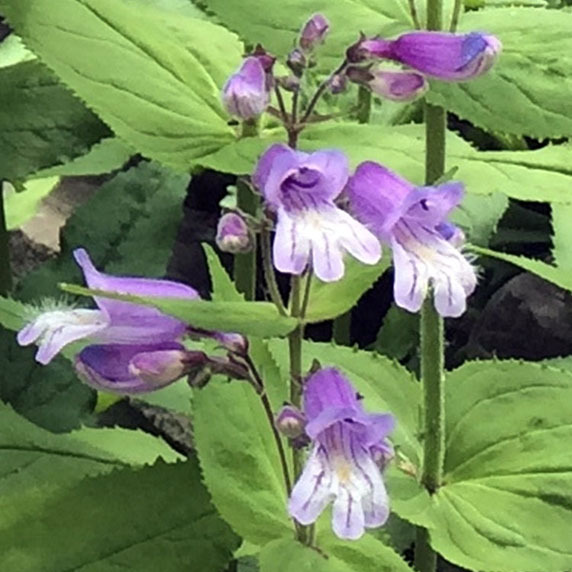 This woodland plant complements other shade plants beautifully, spreading moderately to form a ground cover, bloom in the spring in the leaf axils. 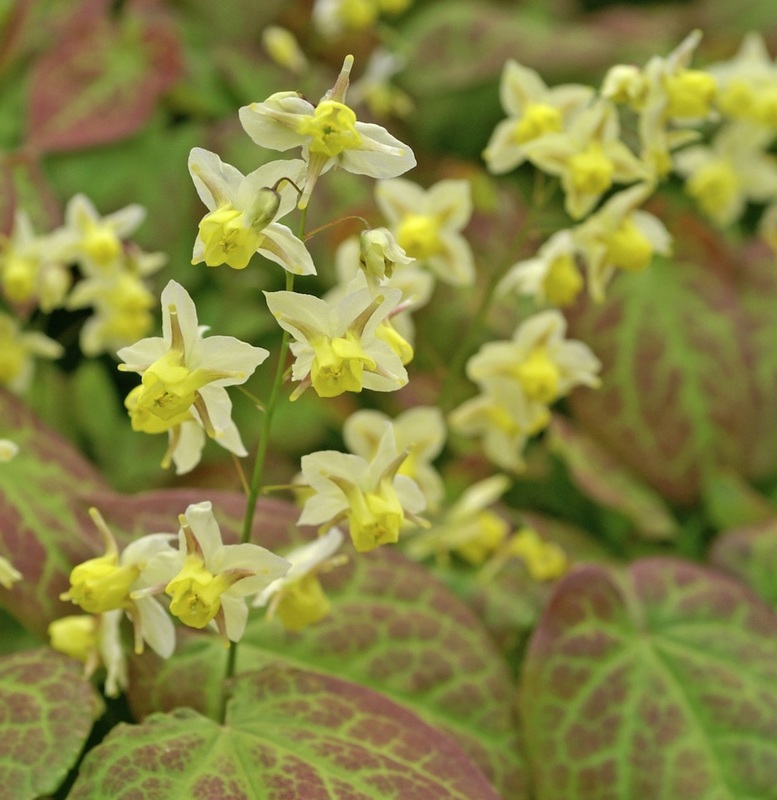 Cold Hardy Sulphureum Fairy Wings is also known as an Epimedium sulphureum. Sulphureum Fairy Wings has light yellow flowers. Blooms mid to late Spring. Grows in zones 5 to 9 in full shade to part Sun and part shade. Reaches between 9 to 12 inches tall. Attracts butterflies and other pollinators. Tolerant of loamy, sandy, or poor soil conditions. Tolerant of drought conditions. Deer and rabbit resistant. An evergreen and slow growing ground cover, plant in garden beds or borders. Orange Queen is also known as Fairy Wings, bishop’s hat, and horny goat weed – Epimedium warleyense. Orange Queen is a coppery orange blooming ground cover. Blooms early to late Spring. Foliage is an evergreen mound of dark green leaves. Grows in zones 4 to 9 in full shade to part Sun and part shade. Reaches 15 to 20 inches tall. Likes good loamy soil. Tolerant of humidity, heat, and drought once established. Attracts butterflies. Deer and rabbit resistant. Resistant to pests and disease. Cold hardy and low maintenance. Plant in containers, rock gardens, or along garden borders. Provides Fall interest as leaves turn bronzy color. A perfect early Spring woodland garden shade plant. 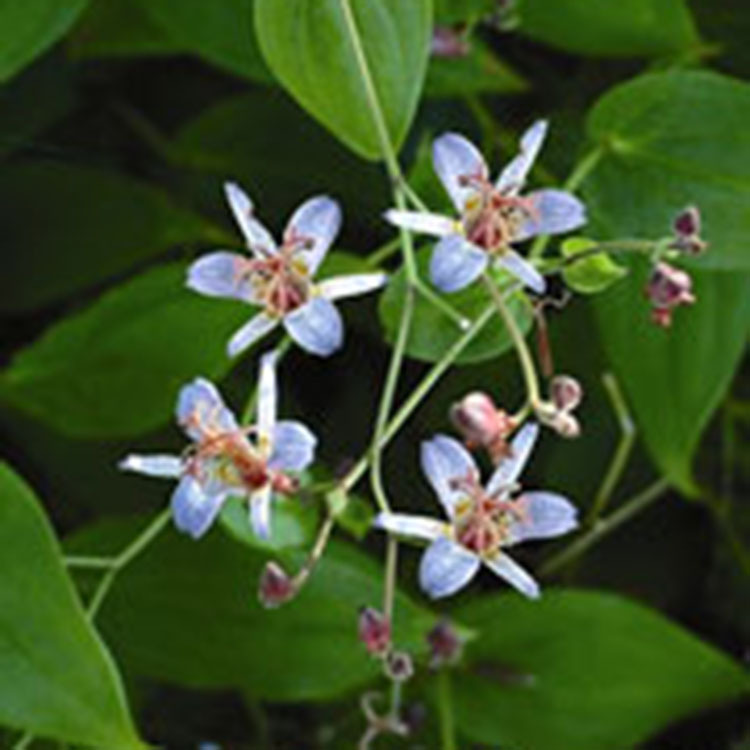 Tricyrtis are also called Toad Lily and Arctic Lily. A shade loving plant, Tricyrtis has orchid like flowers. Ideal for moist, shady woodland areas. Likes well-drained soil in partial to full shade. These lilies bloom when other shade loving plants are done. They emerge late Spring. Profuse bloomers in late Summer and early Fall. Toad Lilies make exotic specimens. They mix well among ferns and hostas. 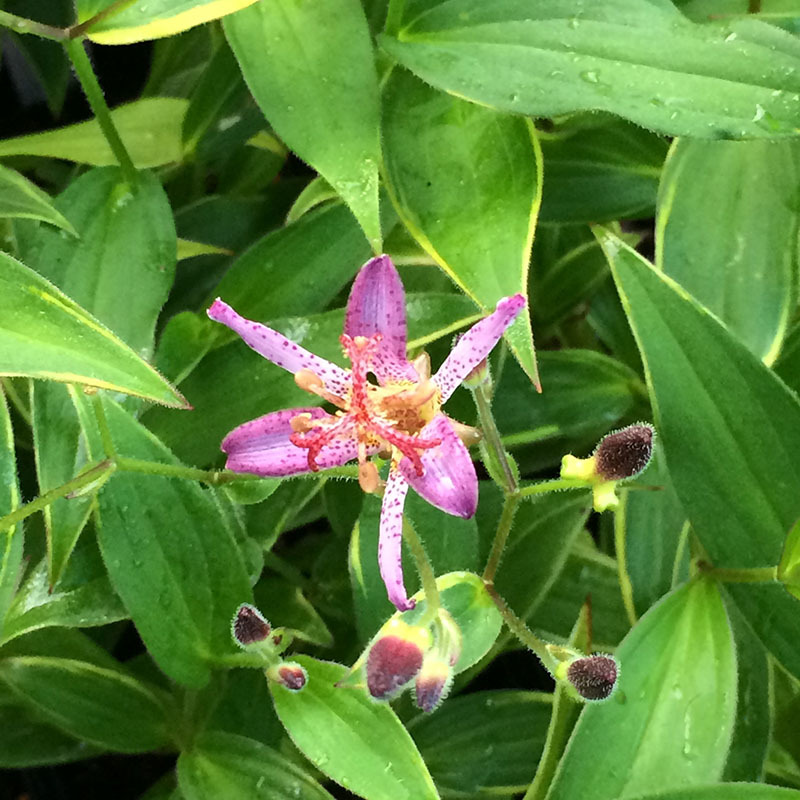 Golden Variegated Toad Lily is also known as Tricyrtis hirta ‘Variegata’ Golden Variegated Toad Lily has orchid-like purple and white flowers with dark purple freckles. Blooms from late Summer to early Fall. Grows in zones 4 to 8 in full shade to part Sun and part shade. Reaches 18 to 24 inches tall. Attracts Hummingbirds. Emerges in the Spring with showy foliage. Then continues into the Summer with strong foliage interest. Plant in full to part shade. Average to moist soils. Amethyst Toad Lily is also known as Tricyrtis lasiocarpa. Amethyst has orchid-like amethyst flowers. Foliage is a lush, deep green offering a fresh look Spring and Summer. Blooms September through October. Grows in zones 5 to 9 in full shade to part Sun and part shade. Reaches 12 inches tall. Performs best in average to moist soils. Wild Geranium is also known as Geranium maculatum. 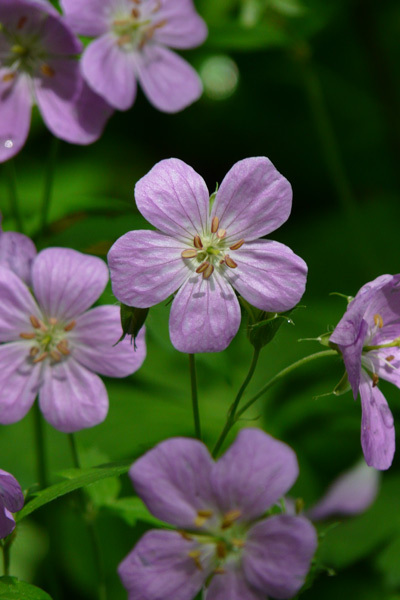 Wild Geranium has lavender blooms during May and June. Grows in zones 3 to 8 in full shade in part Sun and part shade. Reaches 1 to 2 feet tall. Likes soil conditions that are sand or loam with dry to medium soil moisture. Beneficial to pollinators. Wild Geranium has a rhizome root system. Geranium maculatum, a woodland native retains its attractive foliage all season long. Witch Hazel is also known as Winterbloom, Snapping Hazelnut, Striped Alder and Hamamelis virginiana. 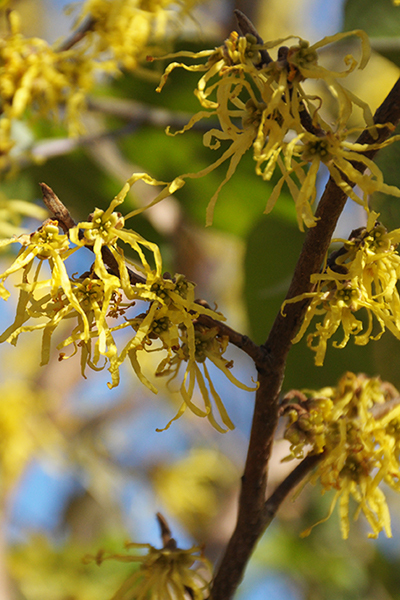 Witch Hazel has fragrant, yellow blooms from September through November. Spring leaves emerge reddish-bronze that turn to a brilliant gold later in the season. Grows in zones 3 to 8 in full shade to part Sun and part shade. Reaches 10 to 15 feet tall. Likes soil that is sandy, loam, or clay with soil moisture that is dry, medium, or moist. Beneficial for pollinators, birds, and serves as a host plant. A native shrub with great fall color, winter interest, and birds eat the fruit. Best known for its late season blooms. Root system is fibrous. Wild Swan Anemone has pale violet buds on tall stems that transform into single pure white blooms. Undersides of blooms are gray-blue-violet color. Blooms in Summer and Fall. Foliage is deep green. Grows in zones 6 to 8 in part Sun and part shade. Reaches between 16 to 18 inches tall. Resistant to deer. Plant Wild Swan in garden beds and borders. Use as cut flower arrangements. 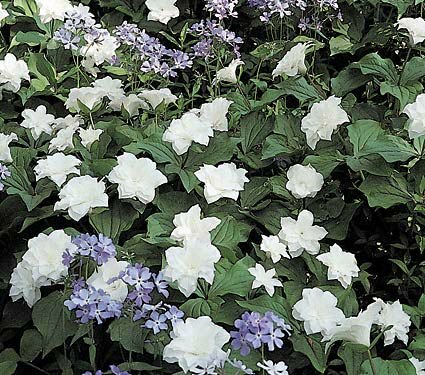 Wild Swan is an excellent woodland or rock garden plant. Tall Blue Larkspur is also known as Delphinium exaltatum. Blue Larkspur thrives in shade in rich well-drained soil in light to medium shade. Native to the woodlands of Ohio and Pennsylvania. 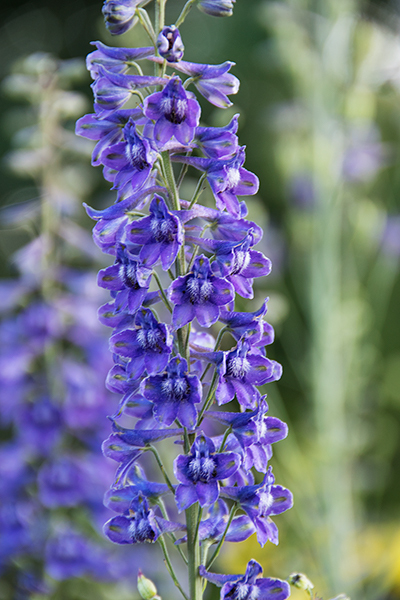 Blue Larkspur has blue blooms that appear in July and August. Grows in zones 4 to 7 in part Sun and part shade. Topping out at 3 to 5 feet tall! Attracts hummingbirds. Tall Blue Larkspur likes soil with a dry to medium moisture level. Likes sandy or loam soil conditions. Delphinium exaltatum is an important mid-summer nectar source for hummingbirds. Larkspur has a fibrous root system. 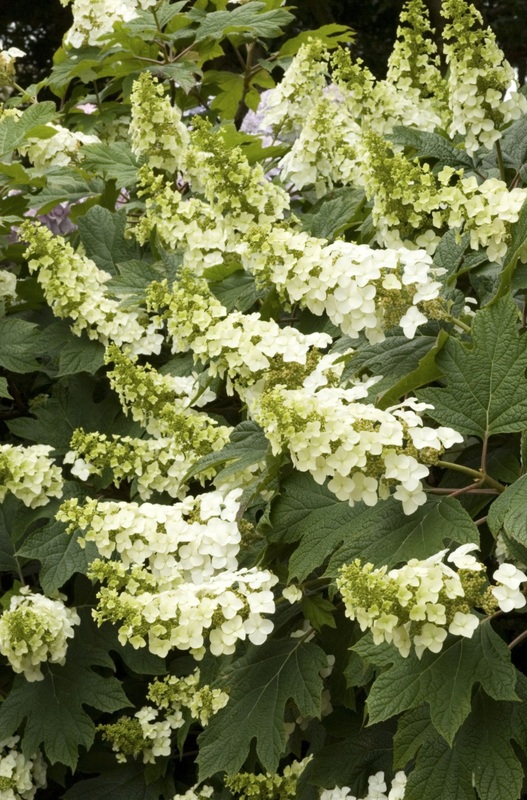 Snow Queen Oakleaf Hydrangea has large dense, white flower clusters on an upright shrub. Foliage is dark, green oak leaf-shaped foliage. Midsummer blooms develop into rosy-pink hues in the Fall. Leaves turn deep red-bronze. Grows in zones 5 to 9 in part Sun and part shade. Reaches 4 to 5 feet tall and 5 to 6 feet wide. Blooms mid Summer. Plant in the landscape as a garden border, cut flower garden, hedge, or Woodland garden. Deciduous plant great for flowering hedge plant, specimen, or foundation plant. Tan brown bark provides Winter interest. Self-sowing Lavender Hyssop is also known as Anise Hyssop and Agastache foeniculum. 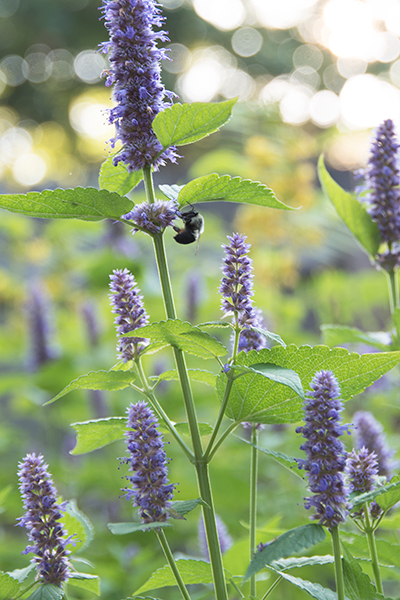 A biennial, crushed leaves of Lavender Hyssop have a fragrance of mint and licorice. Lavender and purple blooms appear from July through September. Grows in zones 2 to 6 in part Sun and shade to full Sun. Tops out between 1 to 3 feet tall. Beneficial for pollinators, butterflies, and hummingbirds. A great addition to herb gardens, borders and perennial gardens. Deer resistant and acts as a host plant. Likes either sandy or loam soil. Likes medium to dry soil. Perfect selection for sunny prairies, open oak woodlands, and savannas. Lavender Hyssop has a fibrous root systems. Hay Scented Fern is known as Dennstaedtia punctilobula. Grows in zones 3 to 7 in part Sun and part shade to full Sun. Hay Scented reaches 1 to 2 feet tall. Likes soil conditions that are sandy, loam, or clay with soil moisture of dry to medium. Deer and rabbit resistant. This fern has a rhizome root system. 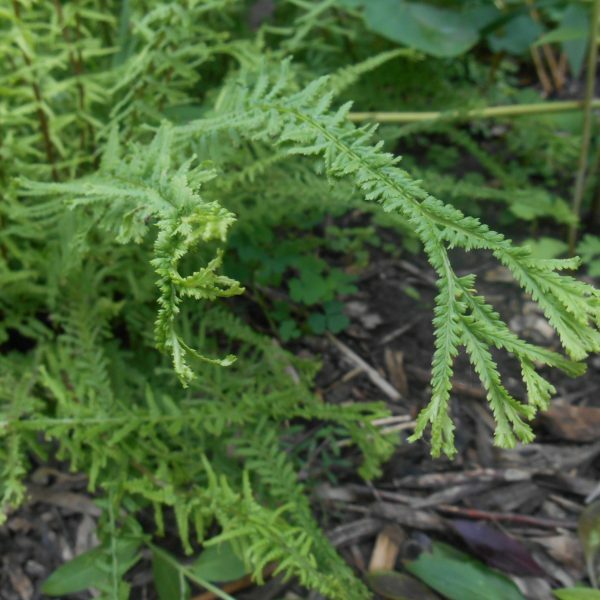 The fern creeps by rhizomes and forms a solid ground cover that weeds cannot penetrate. Naturalize along woodland edges where some Sun reaches the ferns. 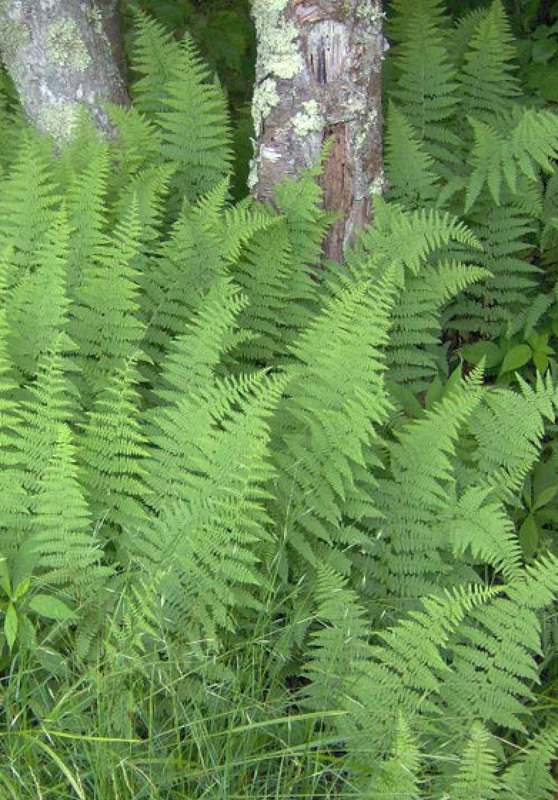 Green fronds are low growing and do not rise above 18 inches. Likes well-drained rocky and sandy soils. Blue Plumbago is also known as Ceratostigma Plumbaginoides. 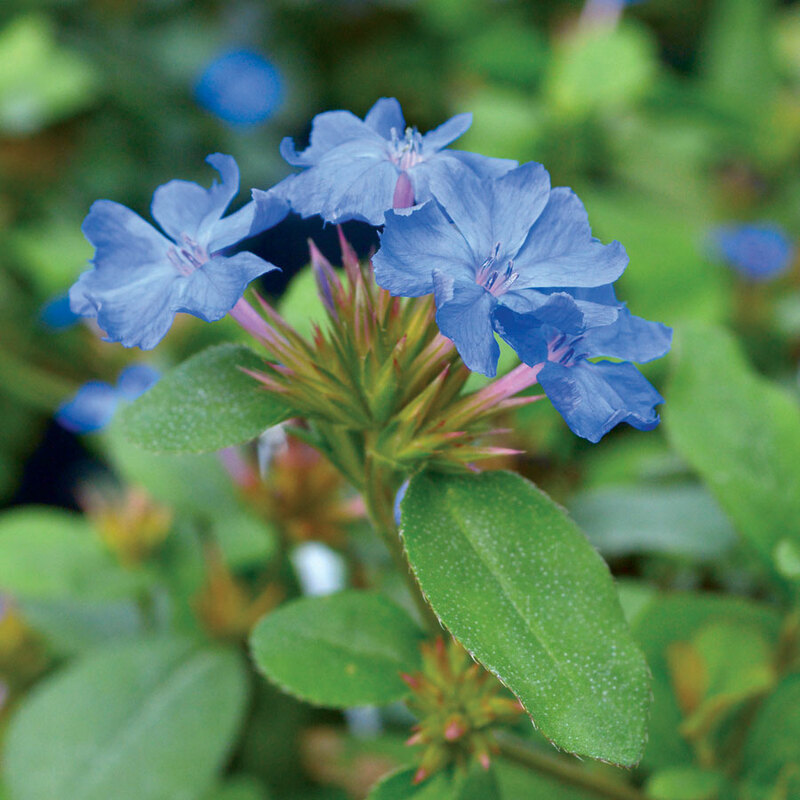 Blue Plumbago has bright blue blooms with rich burgundy-red fall foliage. Blooms late Summer to early Fall. Grows in zones 5 to 9 in part Sun and part shade to full Sun. Reaches 8 to 12 inches high. Likes normal, clay, loamy, poor, or sandy soil conditions. Resistant to deer, disease, and pests. Tolerant of humidity and drought conditions. Tolerates cold and heat temperatures. Plant in garden borders, as ground cover, or in containers. Use for edging, woodland garden, and perennial border. Provides Fall color and Fall interest in the garden. Small’s Penstemon has showy purple tubular flowers. Blooms in May through June with a rebloom in the Fall. Grows in zones 5 to 9 in full Sun to part Sun and part shade. Tops out between 18 to 24 inches. A northeastern native perennial. Deer resistant. Attracts hummingbirds. 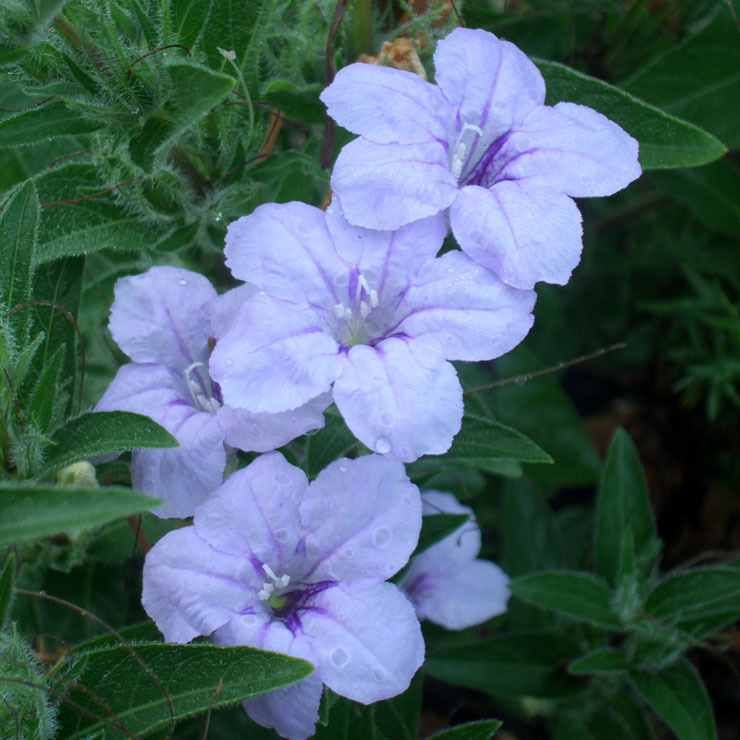 Wild Petunia has lavender flowers from May to September. Grows in zones 3 to 9 in full Sun. Reaches 12 inches tall. Prairie native, tolerant of drought. Attracts hummingbirds, butterflies, and nectar-loving insects. Deer resistant. Likes dry to average soils. Native to open woods and the prairies of Pennsylvania to Indiana and south to Texas. 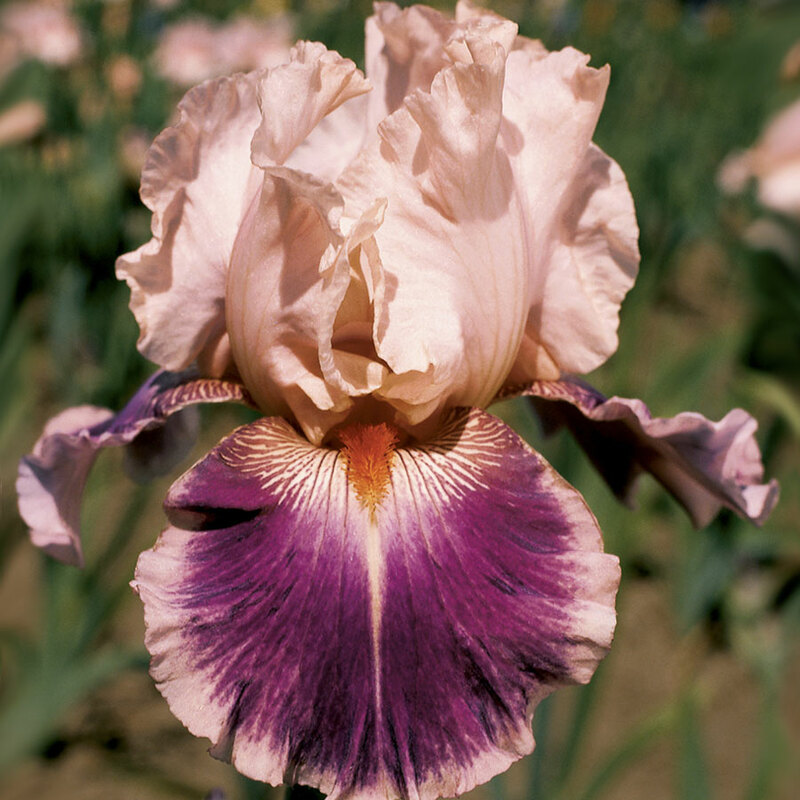 Cherry Blossom Song Iris is also known as Iris Germanica. Cherry Blossom Song has ruffled flamingo pink standards with striped, striated cerise-purple falls. Bright tangerine beards flows out of the center. Blooms late Spring to early Summer. Grows in zones 3 to 9 in full Sun. Reaches 3 feet tall. Low maintenance, easy to care for. Likes most, well-drained soil for bloom production. Plant in cottage gardens or in woodland setting. Naturalizes over time, spreads by rhizome. Deer resistant. Tolerant of drought. Wild Senna is also known as Senna hebecarpa and Cassia hebecarpa. 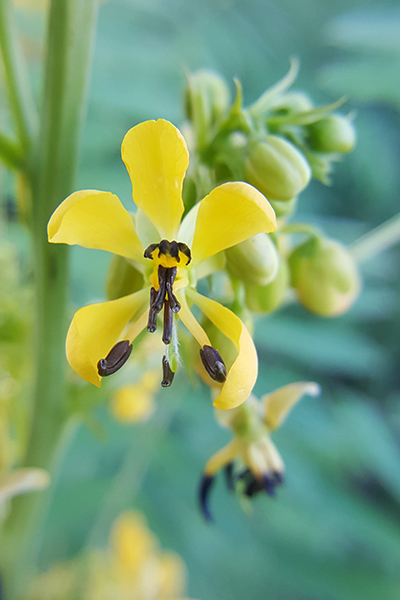 Wild Senna has butter-yellow flowers on top of lush deep green foliage. Blooms July and August. Grows in zones 4 to 7 in full Sun. Reaches 4 to 6 feet. Beneficial for pollinators. Birds are attracted to the chocolate brown seed pods in the Fall. A larval host plant for the Cloudless Sulphur Butterfly. Tolerates clay soil and windy conditions. Thrives in medium to moist soils. Plant as a hedge. 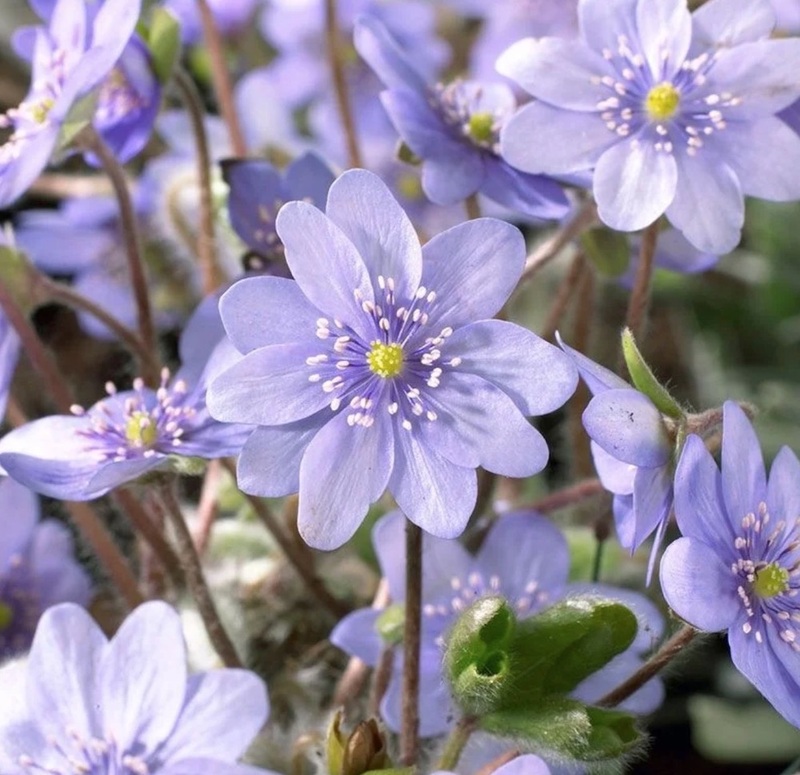 These are our selection of woodland plants to create a garden wonderland. There are many selections to choose from as you can see. For those of you that may be in the Madison, Wisconsin area, there is a Native Plant Sale on May 11, 2019. The sale is held from 9 am to 2 pm. The University of Wisconsin-Madison Arboretum is sponsoring the Native Plant Sale held near the Visitor’s Center. For additional information, clink on this link –> Native Plant Sale. The plant sale is an annual event. Typically schedule the previous Saturday before Mother’s Day. 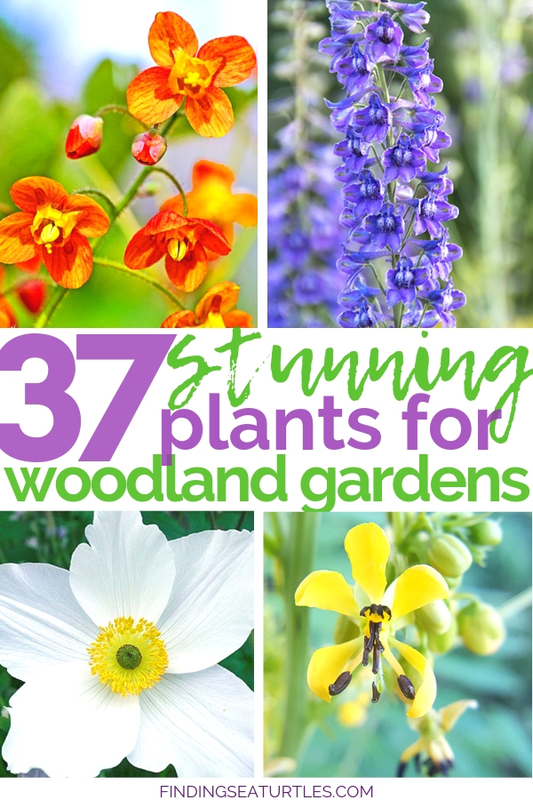 If you try any of these Create a Garden Wonderland with Woodland Plants let us know how you make out. And if you have any questions, feel free to reach out to us. We always are ready to help you out. Thank you for dropping by.